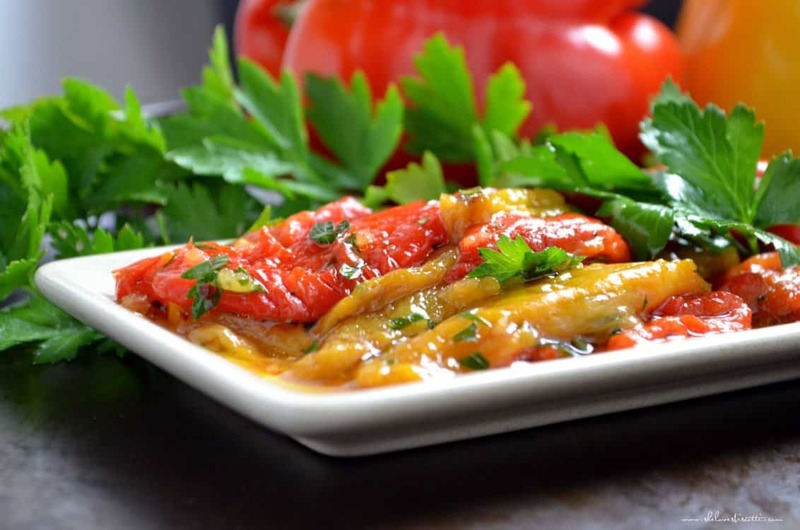 It’s that time of the year to make Marinated Roasted Bell Peppers. I can actually smell the bushels of peppers being roasted in my neighborhood. You won’t believe how easy this is! Wash and dry your peppers. Place them on their sides on a rimmed baking sheet. Roast in upper third of oven heated to 450°F (230°C) until skin is completely charred and the flesh is soft (alternatively, you can use the barbecue). Make sure you turn the peppers, allowing all sides to get black and blistered. Notice how the peppers will also collapse in on themselves. This can take about 1 hour. Warning: the scent of roasting peppers is absolutely intoxicating! While the peppers are roasting, combine the ingredients for the marinade. Once the peppers are done, carefully transfer to a heatproof bowl and cover with plastic wrap. Allow to cool for about 30 minutes. When cool enough to handle, remove stems and charred skins. Cut peppers in half to remove the seeds and then cut in long strips. Place in the bowl with the marinade, along with any juices which have escaped the peppers. This can get a little messy but please, promise me you will not run the pepper under water to speed up the process. You will thank me later. Toss gently and voilà! 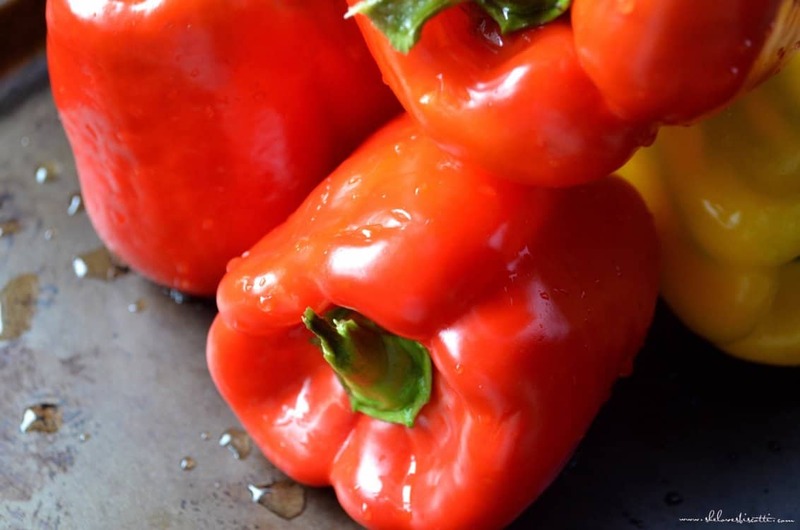 You have just seen how easy it is to make roasted bell peppers and one of my favorite recipes to enjoy that smoky natural sweetness, Marinated Roasted Bell Peppers. 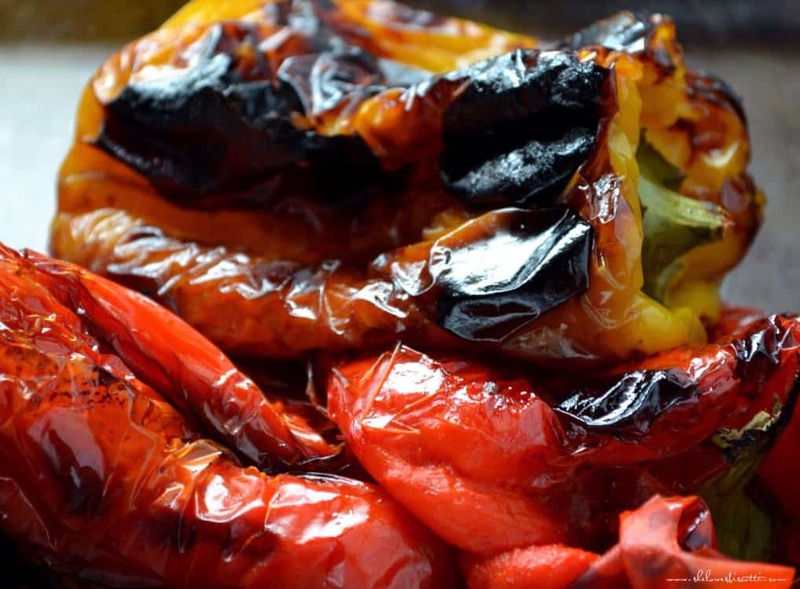 If you do not plan to use your roasted bell peppers right away, the strips can be frozen in plastic bags (Ziploc). You can then use them in the middle of winter! Once again, I return to the food of my childhood and I have my mom to thank for this simple Italian roasted peppers recipe. 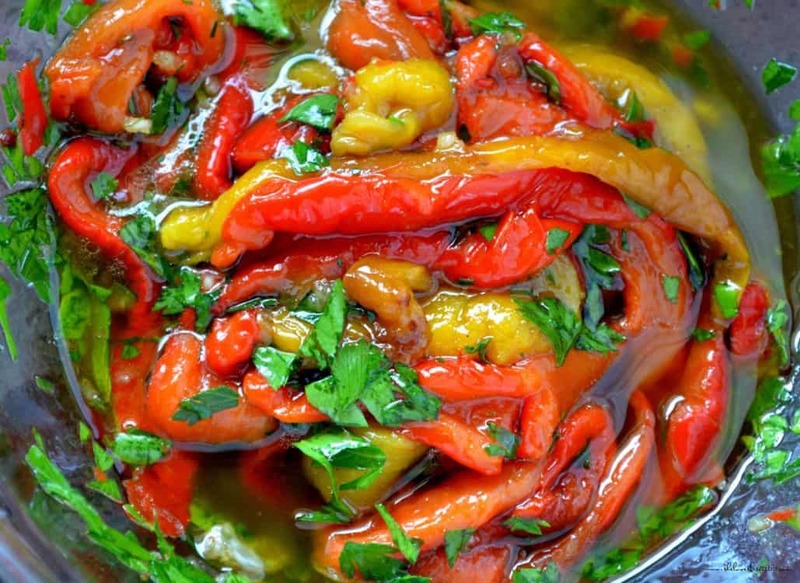 Growing up Italian meant that there was a good supply of roasted peppers in the freezer. At the end of summer, my mom would roast a few bushels of red peppers, remove the skin and seeds, and simply freeze them. 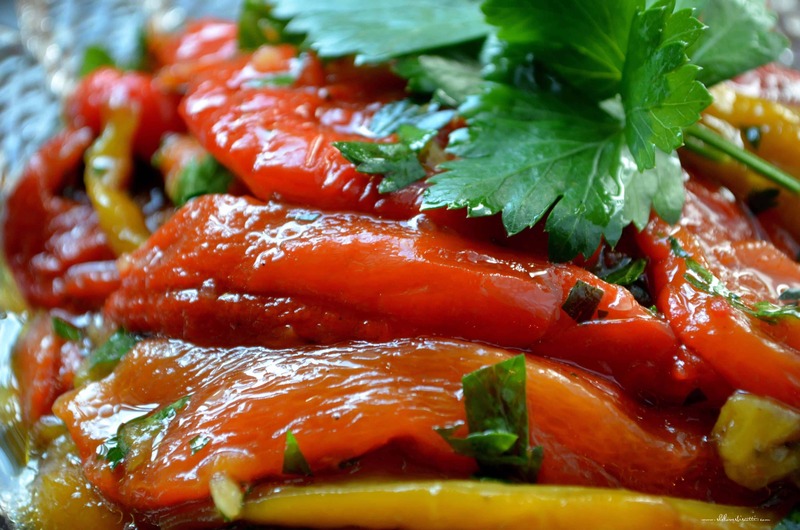 Throughout the year, she would use these frozen roasted peppers to make this recipe for marinated peppers. 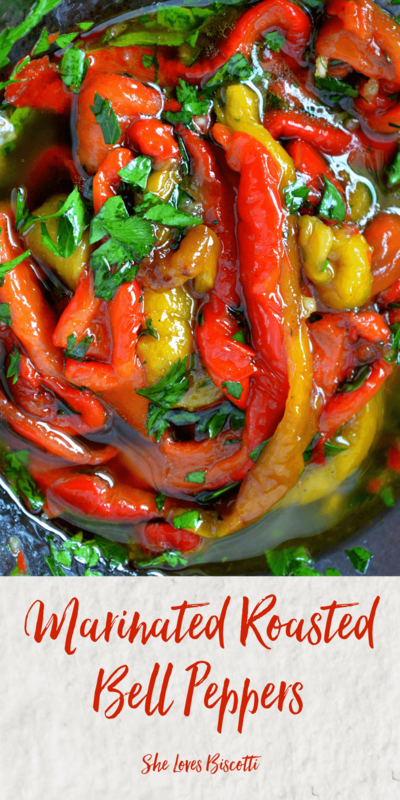 To this day, I continue to make and enjoy this recipe using roasted red peppers. They are great eaten on their own, as a side dish, snuggled in a sandwich, used in salads, tossed with pasta, or my favorite, used as a topping for Homemade Pizza. 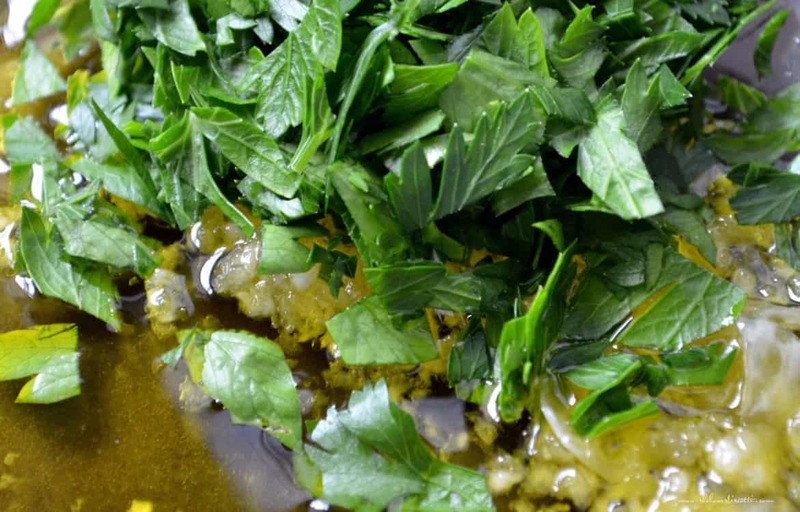 They also make a great crostini topping… did someone say Italian appetizers? 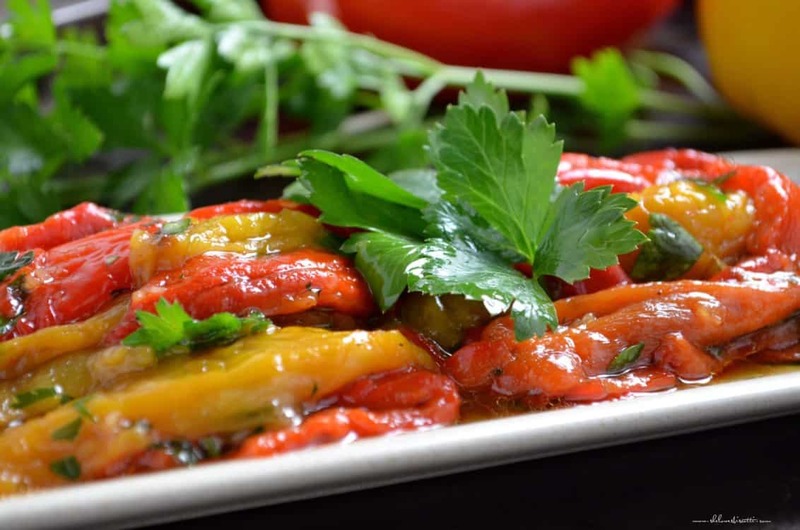 Take one bite -just one, sit back and savor the simple goodness of this recipe for Marinated Roasted Bell Peppers. Hope you are all able to take advantage and enjoy the rest of the summer! 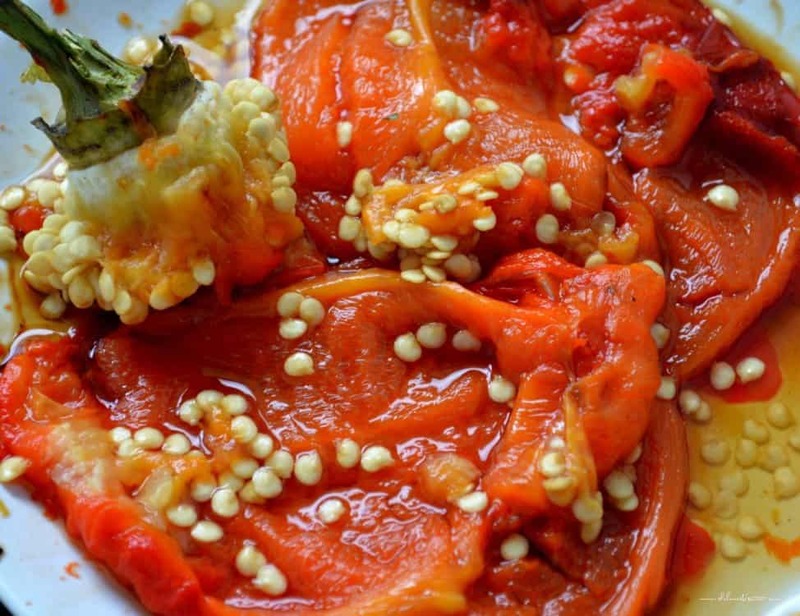 ★★★★★ If you have made this Roasted Bell Pepper Recipe, I would love to hear about it in the comments below and be sure to rate the recipe! Wash and dry your peppers and place them on their side on a rimmed baking sheet. Roast in upper third of oven heated to 450°F (230°C) until skin is completely charred and the flesh is soft (alternately, you can use the barbecue.) Make sure you turn the peppers allowing all sides to get black and blistered. This can take between 45-60 minutes. Once the peppers are done, transfer to a heatproof bowl and cover with plastic wrap. Allow to cool for about 30 minutes. When cool enough to handle, remove stems and charred skins. Cut peppers in half to remove the seeds and then cut in long strips. Do not rinse your peppers under running water. Combine with marinade and toss gently together. Allow to sit for a few hours for the flavors to mingle together. Can be served at room temperature. I grew up with this recipe, my dad made this all the time. He should have written a cook book.I still make these. Mary,yes, just like my mom used to make them.I still do it,great for lunch. Thumbs up! Love your pictures (even zucchini fritters). 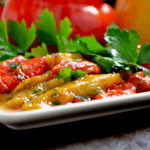 Our moms made simple, tasty recipes. I guess that’s why we are still making them 🙂 Thanks so much for the comment, appreciate it.